Super belated Happy New Year to you, picture book lovers! Hope you all had a wonderful start of the year. Mine was a bit stressful as my beloved cat, Clementine, got ill and it’s still ongoing (but she’s a fighter). Anyway, one of my new year’s resolutions is to keep up with my Book of the Month blog posts. To be a good picture book maker, research is very important. Writing this helps me to read more picture books and analyse what makes good picture books and get inspirations. What’s more, I really enjoy sharing them with you! So here’s the first MOTM post of the year. 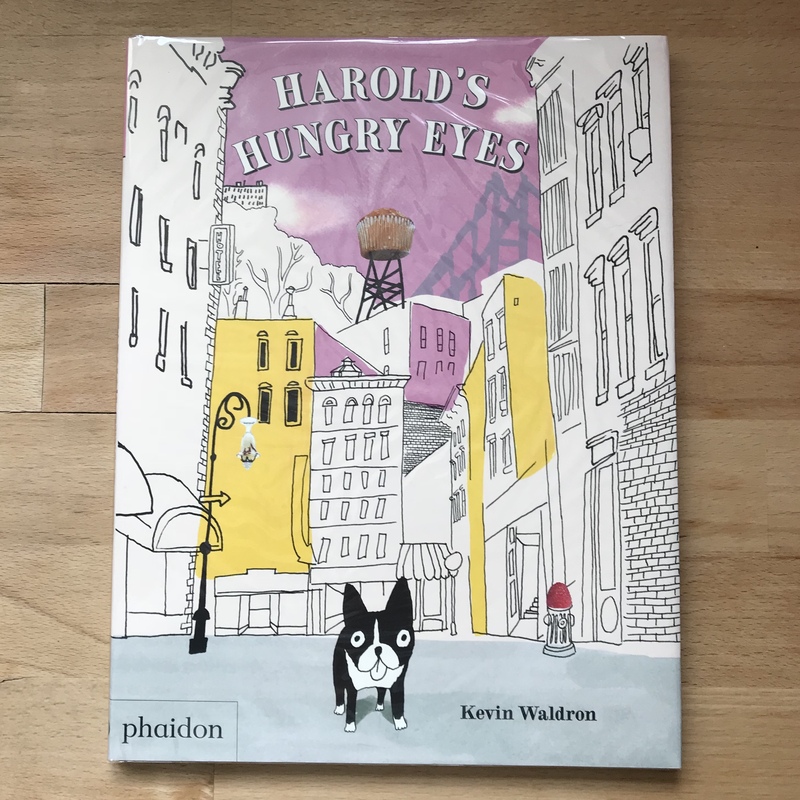 As you might already know, 2018 is the year of the dog, so I picked a picture book featuring a dog – Harold’s Hungry Eyes by Kevin Waldron (Phaidon 2016). The protagonist Harold (I think he’s a French bulldog) is hungry. He’s hungry all the time. His favourite thing to do, after eating, is to sleep on his favourite chair and dream of delicious things. One day, he sees his favourite was being taken away by a garbage truck! Without a second thought, he jumps out the window and chases after the truck. But the chair is gone and little Harold gets lost in the big city. When he tries to find the way home, his hunger gets better of him. Everything around him, from manhole cover to bike wheels, becomes looking like delicious food! He wants to find the way home but there’s so many distractions! But he resists these temptations and he finds the way home (what a good boy!). And at home he find a big surprise waiting for him (I won’t spoil that for you)! To be honest with you, I’m not 100% sure what’s the moral of this story. But it doesn’t matter much when the story is full of charm and humour. Kevin Waldron‘s simple and loose illustrations are so charming. Specially Harold’s expressions are priceless. And the collage, mixing his hand-drawn illustrations with photos of food, to show how Harold sees the world is genius and so humorous. The attraction of this book is the way it invites you to see the world through someone else’s eyes, and what could be better than through a food-obsessed dog eyes!